I wear the male counterpart to these and they are awesome shoes. my wife wears the female versions and swears by them too. They've dropped as low as £55 on wiggle before but never to £45. Snap up a bargain! I run in Boost trainers and have found the weight, response and comfort to be bang on. Not tried Lidl jobbies but these Adidas were designed with the Boston Marathon in mind and therefore are a good road shoe. Use of Awesome is subjective but considering you use a shoe for 600-1000 km paying £45 for a decent shoe than £20 for an acceptable shoe is worth it for me. Can't say I've worn the Aldi or Lidl trainers but I suspect these are in a different league. They are a lightweight shoe for fast training and racing (though I use them for everything). There is not lots of cushioning so if you're fairly heavy they may not be for you as you might feel it in the knees and calves. They are hard wearing, I tend to get 450-500 miles out of a pair and I don't babysit them. I suspect if your asking the question then perhaps they're not for you (yet). If you run regularly and like to run fast then these are a great shoe!! Sweatshop were getting rid of the 7,s earlier this year for £25 a pair, i had 3 pairs, pretty good they were for the money. the weight will be the main difference. I had a pair of Lidl trainers before and there was nothing wrong with them, did a few half marathons and a sprint triathlon wearing them and they were fine, probably got about 500 miles out of them. Since then I have lost some weight myself and prefer more light weight shoes. These Adidas weight 220 grams and the Lidl ones were over 300 probably 100 grams more per shoe, if you take 40000 steps during a marathon that is 4000kg more you will be lifting. Can't say I've worn the Aldi or Lidl trainers but I suspect these are in … Can't say I've worn the Aldi or Lidl trainers but I suspect these are in a different league. 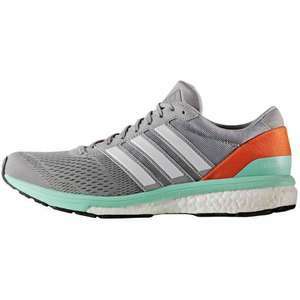 They are a lightweight shoe for fast training and racing (though I use them for everything). There is not lots of cushioning so if you're fairly heavy they may not be for you as you might feel it in the knees and calves. They are hard wearing, I tend to get 450-500 miles out of a pair and I don't babysit them. I suspect if your asking the question then perhaps they're not for you (yet). If you run regularly and like to run fast then these are a great shoe!! the weight will be the main difference. I had a pair of Lidl trainers … the weight will be the main difference. I had a pair of Lidl trainers before and there was nothing wrong with them, did a few half marathons and a sprint triathlon wearing them and they were fine, probably got about 500 miles out of them. Since then I have lost some weight myself and prefer more light weight shoes. These Adidas weight 220 grams and the Lidl ones were over 300 probably 100 grams more per shoe, if you take 40000 steps during a marathon that is 4000kg more you will be lifting. Haha! Brilliant answer. Anti-brand mindset of it's all the same stuff but you're just paying extra for a logo - destroyed. Lovely stuff!